Tommy Regan picked up the 3rd last-place finish of his NASCAR Camping World Truck Series career in Sunday’s Chevrolet Silverado 250 at Canadian Tire Motorsport Park when his #0 Driven2Honor.org Chevrolet fell out with engine trouble after 0 of 64 laps. The finish, which came in Regan’s seventh series start, was his second of the year and his first since Texas, eight races ago. He now jumps to third in the 2017 LASTCAR Truck Series standings, trailing a tiebreaker with Todd Peck and Joe Nemechek. In a year that saw him make his Cup debut at Sonoma while also parking Truck Series rides for both Jennifer Jo Cobb and Norm Benning, Regan returned to the Cobb team for the first time since Texas to drive Cobb’s white #0 Chevrolet. It would be Regan’s first Truck start at Mosport, and would come as one of 32 drivers who entered, guaranteeing that he and the other entrants would start. Regan didn’t participate in Saturday’s opening practice session, then turned a single lap in Happy Hour, ranking him 30th of the 32 drivers. His lap of 81.386mph was completed in 108.770 seconds, just under 30 seconds slower than Christopher Bell’s lap at the top of the charts. Regan didn’t turn a lap in qualifying, placing him 31st on the grid based on Owner Points. Starting last was the only other driver who didn’t turn a lap in qualifying, Truck Series newcomer Joe Hudson. Hudson was ranked beneath Regan as his ride, Mike Harmon’s #74 Chevrolet, was making its first series start since November 11, 2016. This gave Harmon’s team a two-continent sweep on starting last, combined with Harmon’s own last-place start in the Red Farmer throwback at Darlington. The truck carried sponsorship from Alaska Raceway Park. When the race started, Mike Senica fell to the back as he reprised his role driving Norm Benning’s #57 Chevrolet this time didn’t carry sponsorship from Senica’s longtime sponsor Bell Plantation. Senica started the race 8.396 seconds behind the race leader. But while Senica was the last car on the track, he was only 31st, as Regan had yet to cross the stripe. 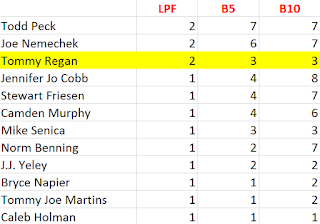 While the FS1 cameras showed Regan sitting in the 31st spot on the grid prior to the start, engine issues were the official listed cause of his sudden exit, and he was listed out by Lap 4. 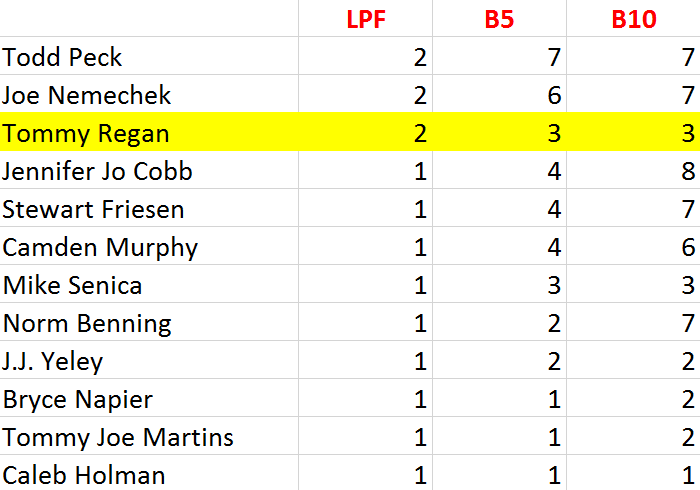 UPDATE (Sept. 7): More details about the Regan last-place finish. According to motorsports artist Robert Taylor, who worked as Mike Senica's spotter on Sunday, Regan's #0 had mechanical problems from the moment it was unloaded, including engine, radiator, and transmission issues. This required the Cobb team to swap parts between Regan's #0 and Cobb's #10. The #0 also failed inspection on one go round, then passed by race day. Unfortunately, it wasn't enough to keep the truck running. The rest of the Bottom Five filled quickly. 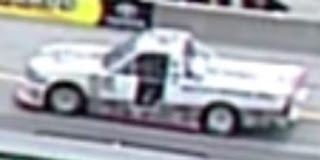 On Lap 1, Joe Nemechek pulled off the track in his #89 Fire Alarm Services / DAB Constructors Chevrolet, a truck with the “J.H.” of his son’s name covered by a square of black tape on the roof rail. That same time by, Senica had fallen back to 34.767 seconds behind the leader and 1.780 seconds behind the next truck of Jennifer Jo Cobb. Senica then then dropped to 55.698 seconds behind the leader the next time by and was promptly lapped before he, too, took his truck behind the wall. By Lap 6, when Joseph Hudson’s #74 slowed on the far outside exiting the hairpin curve, Jennifer Jo Cobb briefly held 29th in her Driven2Honor.org Chevrolet, but then passed Todd Peck’s #63 MB Motorsports Chevrolet before both retired. Hudson ended up just outside the Bottom Five in 27th. *This marked the third last-place finish for Cobb’s #0 in five races and the fourth for Cobb’s team in that time. Chris Lafferty took the inaugural in 2013 followed by Caleb Roark in 2014, both of them going on to claim the LASTCAR Truck Series title for those seasons.